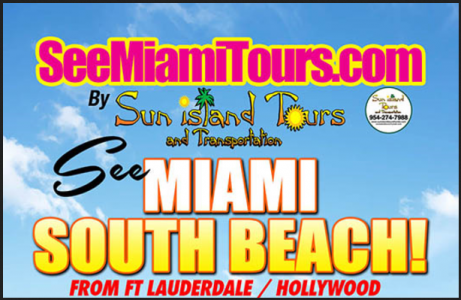 Sun Island Tours and Transportation is a leading tour and transportation service that has been serving all of Fort Lauderdale, Hollywood Beach, and Miami for more than 10 years. From buses & passenger vans to large luxury cars and SUVs we have the most extensive range of vehicles to meet your transportation needs. Apart from sightseeing tours, we also specialize in Airport/Cruise Port Transfers, group dinners, Stadium/Sports Events, Family Trips and Reunions, etc. For any further inquiry about our services, call us at 954 274 7988.